DRIVING a Grady White 376 Canyon after only recently manning tinnies was like being in a jet fighter after arriving in a Kingswood. That was my feeling on Sydney Harbour after I'd taken the wheel of the big $800,000-plus American craft sporting triple 300hp Yamahas. Pointing its prominent flared bow between the city’s heads and nudging the throttles forward brought a smooth growling response from out back and three of us were quickly thrust forward as the Grady White dealt with the rolling northeast swell. To say the hull made short work of the typical harbour summer conditions is an understatement. The Canyon’s ride was impressively plush and the boat deceptively quick, easily hitting 42 knots before I decided backing off might be a good idea. Having easily transitioned on to the plane I’d been taken aback shortly after when a speed reading on one of the boat’s two Garmin 16-inch screens indicated 28 knots – it felt more like 18. According to dealer principal, Ryan Short, the 37-footer as it was set up was good for around 46 knots. It wasn’t hard to believe. Considering the Canyon 376 is also rated for a maximum of 3 x 350hp an extra 150hp should see it easily top 50 knots, making it one fast performer for a boat of its size and intended market. 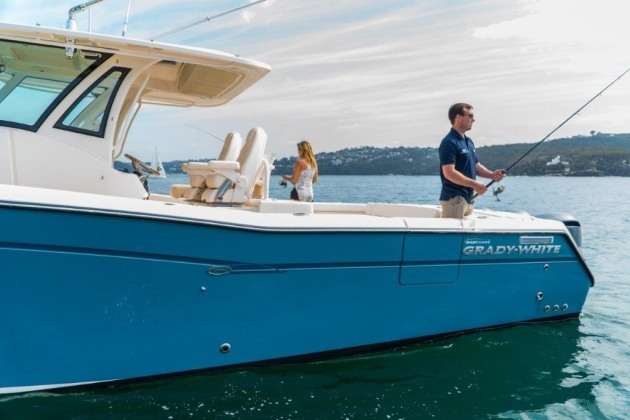 The Grady White 376 Canyon was designed with fishing at the forefront. While going at such speeds for long periods wouldn’t help your fuel bill it’s nice to know you can get home in a hurry if it turns nasty offshore and do so without feeling the need for a chiropractor afterwards. To that end, courtesy of what Grady White calls its Sea V2 “continuously variable Vee” hull we were treated to a soft and stable ride as the boat carved through peaks like a knife through butter, the hull’s strakes and chines combining to deflect spray well away. Interestingly, while featuring a 20 degree deadrise at its transom the angle of the hull’s Vee continues to sharpen all the way towards its bow stem. According to the Grady White website a “SeaV² hull with 20 degrees of deadrise at the transom will have around 30 degrees amidships”. GW foam filled hulls are claimed to be unsinkable and for longevity feature no timber construction. The SeaV2 hull clearly delivers as the Canyon not only rides very well it feels rock solid as you move around the deck, making it a potentially perfect craft for fishing blue water. While we didn’t have the time or appropriate fishing gear to drive to the Continental Shelf there was enough going on at the harbor mouth to give an insight to the boat’s fishing manners. A school of salmon had busted up just out of Middle Harbour and gave us a chance to throw lures at them and see how the boat behaved. While 900hp on tap is mass overkill for chasing harbour salmon it didn’t have any obvious negative effect on the schooling fish. Idling up towards the action with the whisper quiet Yammies was a piece of cake and had no more spooking effect on the fish than the two nearby tinnies targeting them. As it turned out the salmon were in a typically fussy mood and wouldn’t touch the small metals we threw at them, or any offerings from the other boats. Either way the brief session indicated that the Canyon was designed with fishing at the forefront. There are loads of rod holders and storage areas around tghe spacious deck. Being a centre console, working from all around the deck is easy. There’s very healthy freeboard for peace of mind and the gunwale height is good for bracing yourself against for extra stability or in the event of fighting fish, for which the all-round padding would be appreciated. There are also toe rails in the rear cockpit for getting your feet under for added comfort and stability. While the bow section might look more work-on-your-tan friendly than serious fishing duty, it’s not the case. A handy drop-in deck section quickly converts the bow lounge area into a roomy casting deck as demonstrated on the day by Celeste Parker who'd tried in vain to tempt a salmon. I too moved around the boat casting lures and found the boat overall to be very fishing friendly. Sporting a massive 4.01m beam the hull felt billiard table stable and moving from bow to stern to cast at busting fish had no effect on its attitude. Back to the driving aspect, which is sure to be a pleasurable experience for any potential Canyon 376 owner, the view forward was very good, even for someone height challenged. The all-round glass console affords good vision from all angles and a windscreen wiper helps in wet or rough weather. 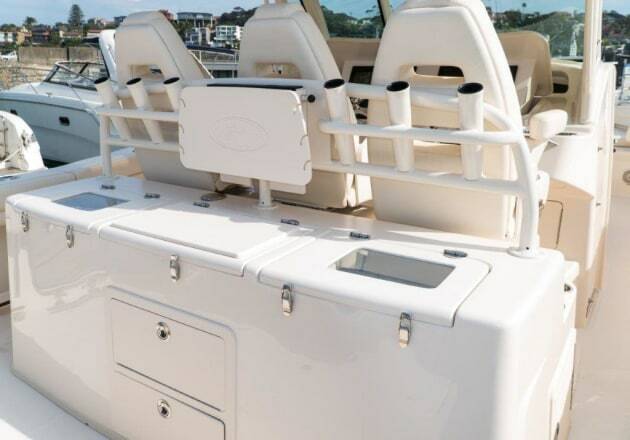 The console can also be further weatherproofed with the addition of side clears and a rear sun shade. The boat is very trim responsive (and features Bennett trim tabs for extra stability) and responds precisely to commands from the wheel. The boat has a sporty feel and can be thrown around effortlessly like a much smaller craft. The helm seat features three adjustable plush armchairs with arm rests on a single bench, each with bolster support. There’s also a foot support (with storage below) and a handy folding rail that can be stood on for extra height and added vision. Jumping into the driver's seat felt like climbing aboard a jet fighter! The Canyon 376 comes loaded with a pile of standard quality features that help justify its price tag. The instrument and electronics console can be fully concealed and raises and lowers at the push of a button, impressive from just a security aspect alone. 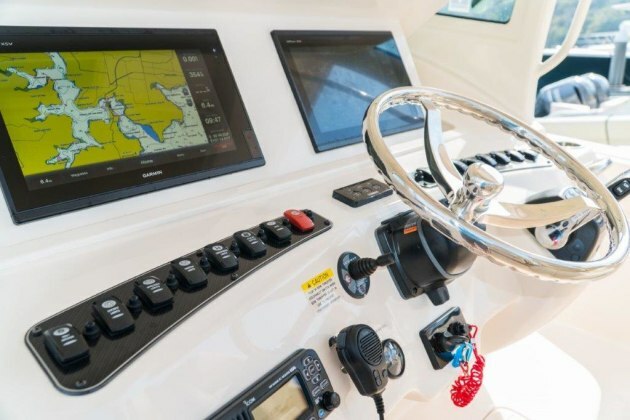 The boat also boasts two live wells situated aft of the helm seat, a massive refrigerated transom kill tank and it’s hard to miss the outriggers mounted to the console’s hard top. There’s loads of deck storage space on board as well as tackle drawers, rigging station and sink, anchor winch, barbecue grill, and a healthy number of rod holders – six around the gunwales and six behind the helm seat as well as side storage; the only potential addition for rod storage might be a rocket launcher mounted to the hard top. The rear lounge easily folds away for added fishing space and the rear main self-draining deck is complemented with the addition of a portside marlin door, which as well as the obvious advantages for bringing big fish aboard, would double for diving and swimming duty. Typical of an American boat of this quality, everywhere you look there are nice detail touches that add to the on-water experience including storage pockets and drink holders all around and no shortage of plush padded seating. Last but not least, below deck (via a starboard door) is a double vee berth, head, shower sink, TV and anything else you might need for a temporary on-water home away from home.